If you have an area outside where you can mount a large holiday decoration it would be fun to make your own giant Christmas wreath. This is a guide about making a giant Christmas wreath. 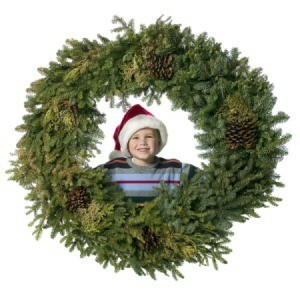 Does anyone have instructions for making a GIANT wreath for Christmas? The one I want is large enough to step through. I saw one mounted on a porch at the front just above the steps and was 6 or 7 feet tall. I think it was made of plywood. It had greenery attached (probably stapled) to it and a large bow on top. White lights were put inside the greenery and it was very attractive. Hope someone can help. Maybe you could use a big hula hoop and wire greenery around it. Then wrap the christmas lights around the whole thing. They sell hula hoops at the dollar store, if you have a pine tree you could trim branches from it, and the lights are fairly inexpensive too especially when you get them after christmas. You might be able to use old coat hangers for the wire or buy it at the hardware store. You could do the whole wreath for a few dollars. I'm originally from the cold country of Maine and I always made fresh balsam wreaths every year. Some of them I have made have been to put on peoples' barns and they were double sided wreaths, meaning the boughs were on both sides making the wreath thicker. I used wire that was about 1/2" thick and wound the wire around several times to make it stable to with hold the weight. I also took wire as thick as a coat hanger and wound that around, it was really sturdy. Then I put clumps of the balsam around, wiring it with 18 gauge wire that, you can get the wire at hobby lobby or any craft store. Just put a clump on front first then flip the ring and do the same to the back and continue this way till finished. They are beautiful and smell so good. An old bicycle wheel makes a great, sturdy wreath frame. You can leave the spokes in and weave ribbon through them to the height you wish, or simply cut them off with a bolt cutter. I constructed them using 3/4" plywood, since mine needed to be rigid to hang on my house, and not sag. A 4' ring can be cut from a single sheet of plywood, but if you overlap and reinforce sheets together, you can make it up to 8'. Layout the circles with a homade compass. I cut it out with a jigsaw, making the wreath band about 10" wide. To make it weather resistant, I caulked all the cut edges of the plywood, then primed, and painted with dark green paint. This seems extreme, but moisture will cause the plywood to warp if not sealed. A more expensive but indestructable material called "Koma" is available at some lumber suppliers. It is available in sheets or boards, and is a plastic, paintable, waterproof material. I then stapled on the synthetic garland, and attached masses of lights, and a large bow. It's very impressive, especially glowing at night. It's a heavy project, using all the wood. Have fun, wreaths are great.